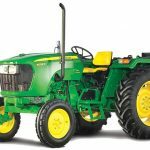 Are you looking for the history of John Deere 420 model? 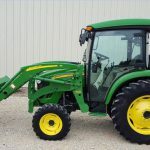 Here are the full details of John Deere 420 model such as its history, Pictures, Attachments, Review, engine, specification, price, transmission, parts, capacity, PTO, dimensions, electrical system etc. Find out it below. 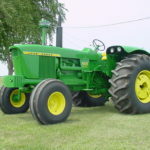 John Deere 420 (1958) was the utility tractor with live 3 points. 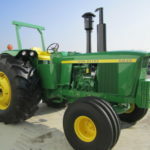 420 model replaced the 40 of the John Deere tractors in 1956. The 420 was built from 1956-58. 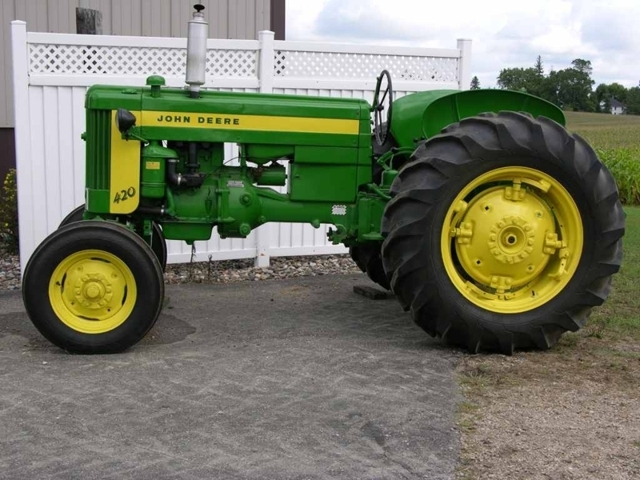 Production of the John Deere 420 began in October of 1955 for the 56 model year and continued until October of 1958. The total mass production of 420 was in huge amount of 55,000. There were three types of models were produced for 420’s corresponding to the three years manufactured. 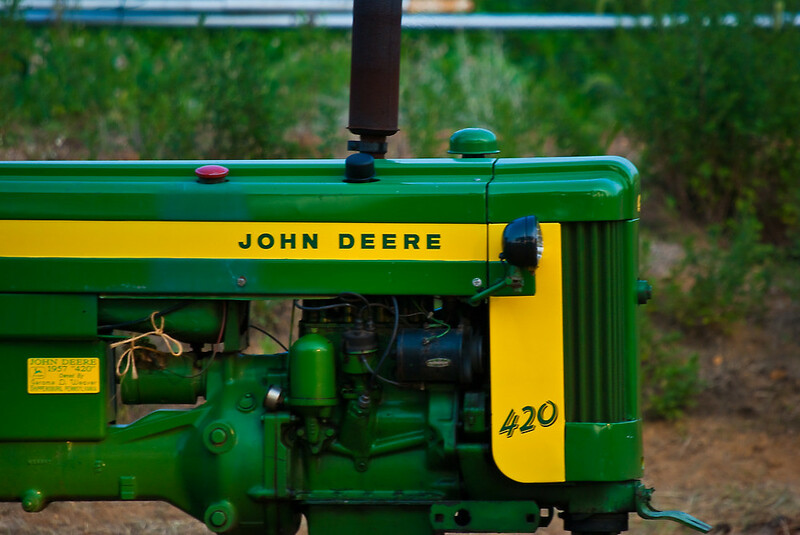 John Deere 420’s engine was more fuel efficient and powerful with two-cylinder. The increase in compression and the resulting heat was too much for the cooling system. 420’s engine produces 28hp of great power. It’s rated RPM is 1850. 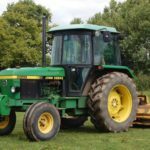 The engines used for the 420 tractors were basically the same as those on the 40 but in addition to an increase in power of about 20%. Bore and stroke was 4.25 x 4.00, Displacement of 113 ci, 1850 rpm, compression ratio of 5.2 to 1 and 27.1 drawbar and 29.2 belt horsepower. A new cylinder head designed with improved combustion chambers technology with a higher lift cam and a latest carburetor. 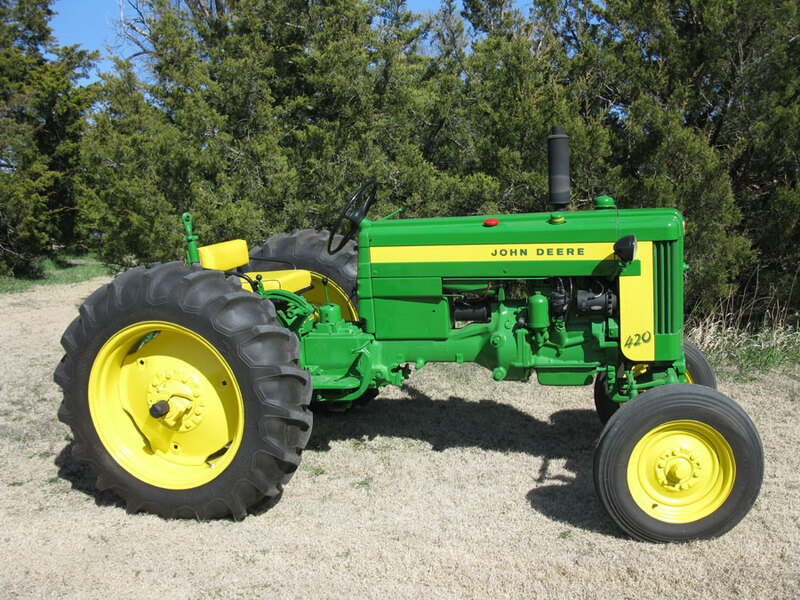 John Deere 420 (1958) was the utility tractor with live 3 points. The 420 had so many configurations, a powerful engine of 28hp and very popular among the farmers. 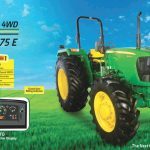 There was suitable versions for every farming operation, a 420 General-Purpose, Standard, Hi-Crop, Special, Utility, and even Crawler, each with respective wheel layout.